Every year, the Lawrence Cultural Arts Commission honors five local artists or arts-based organizations with the Phoenix Awards. 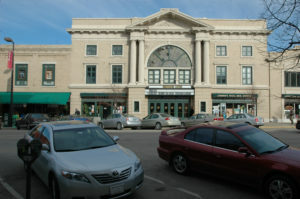 Now in their 19th cycle, the awards are meant to recognize outstanding artistic achievement in the Lawrence community. This year’s winners are Lora Jost in the visual arts category, Marilyn Stokstad in the arts educator category, the Lawrence Civic Choir in the performing arts category, Lauralyn Bodle in the musical arts category, and Heidi Raak and The Raven Book Store in the creative spaces category. 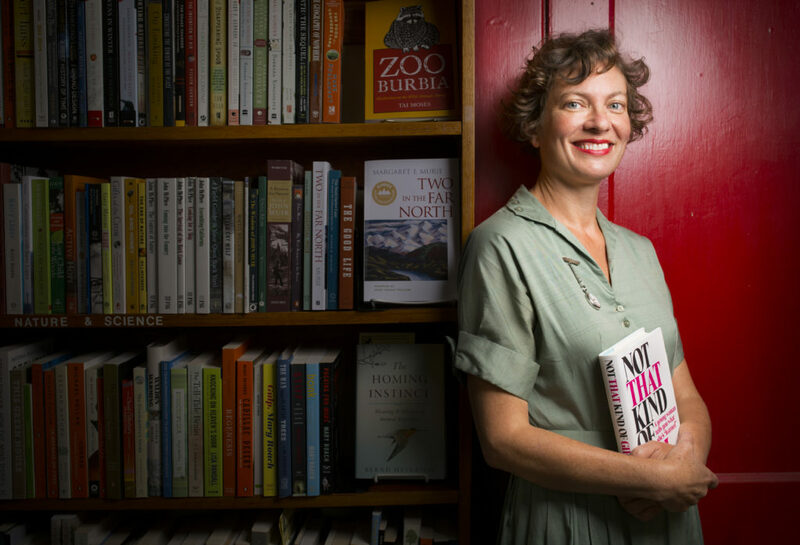 Phoenix Award winner Heidi Raak, owner of the Raven Bookstore is pictured at the downtown bookseller on Thursday, Oct. 9, 2014. A ceremony to honor this year’s Phoenix Awards winners will be held at 2 p.m. Nov. 2 at the Lawrence Arts Center, 940 New Hampshire St. The ceremony and reception are free and open to the public. The Raven Book Store, 6 E. Seventh St., is like a warm, cozy sweater in brick-and-mortar form. Nine employees, two cats and books from floor to ceiling share the 1,250 square feet that make up the store, a Lawrence literary institution for the past 27 years. At its helm is Heidi Raak, who took over the store in 2008, and, despite calling herself a “modest and private person,” has made it her mission to share her love of reading with all of Lawrence. Through events like author readings, book groups and the monthly Big Tent Readings (a genre sampling from various, mostly local, authors), Raak and her employees (she stresses it’s a team effort) have worked to make The Raven a welcoming haven for Lawrence’s book-loving community. 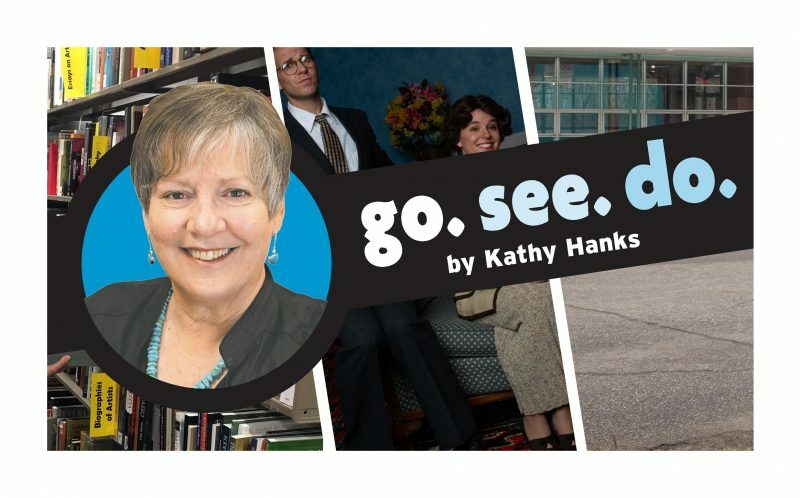 “She and her staff are deeply committed to literature in all its forms, deeply knowledgeable and absolutely to be trusted when they say, ‘You’ll love this book,’ Judy Roitman says in her nomination of Raak. The “Parcel” literary journal, a collaboration between Raak and editor Kate Lorenz, is one of the store’s newest projects. Additionally, the Raven has continued to sponsor the Langston Hughes Creative Writing Award with the Lawrence Arts Center for more than 15 years. For Raak, an avid reader since childhood, some of the best perks of the job come from day-to-day interactions with customers. Phoenix Award winner Lauralyn Bodle. Lauralyn Bodle couldn’t help it — she has been making music practically from birth. 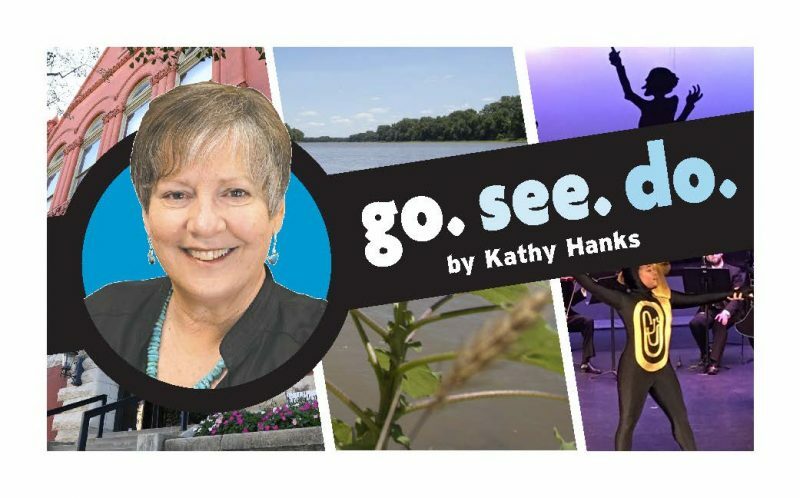 Growing up in Lawrence, her parents kept a room at home stocked with instruments of all kinds — a piano, French horn, violin, viola, snare drum, a belly-back mandolin — and then there were the boxes and boxes of sheet music. “Our cat had kittens in a box of music on top of the piano,” Bodle recalls. Piano came naturally to her, and by the time she was 12, she had already snagged her first professional gig playing piano for the opening of the Watkins Museum. Later came violin and a proficiency in “pretty much any string instrument.” She taught herself guitar as a teenager so she could accompany herself while singing Girl Scout songs. These days, she’s busy teaching others. And not just music, either. Of course, she’s offered private music lessons since high school and still does. Bodle, it turns out, is also a math whiz and a voracious learner of languages. 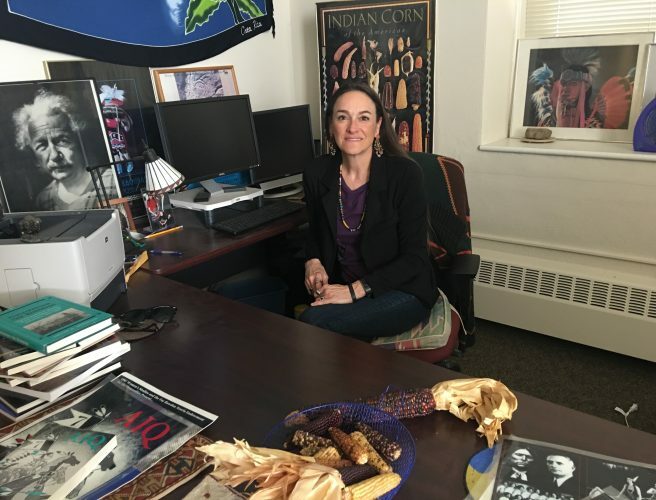 In both her music lessons and Italian courses at Kansas University, she gives the same message to her students. “Make your mistakes with conviction, because half the time, you’ll be right, and if you aren’t, nobody will know,” Bodle says. Bodle, despite her protestations (“I get tired sometimes”), appears tireless. 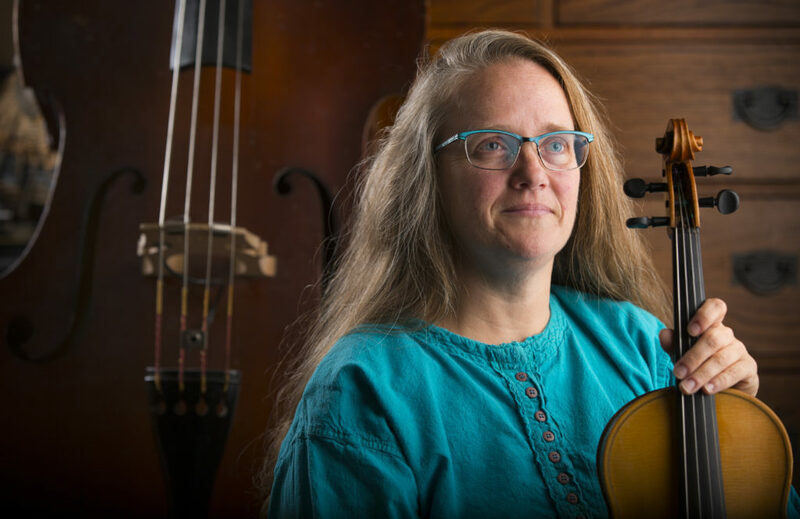 In addition to performing in a number of local groups, perhaps most notably the Alferd Packer Memorial String Band, she has been involved in various positions with the Kansas State Fiddling and Picking Championships for the past 15 years. Most recently, she was awarded a grant from the national Country Dance and Song Society to make Lawrence one of seven stops on its 2015 North American tour. Phoenix Award winner Marilyn Stokstad is pictured at her home on Wednesday, Oct. 8, 2014. 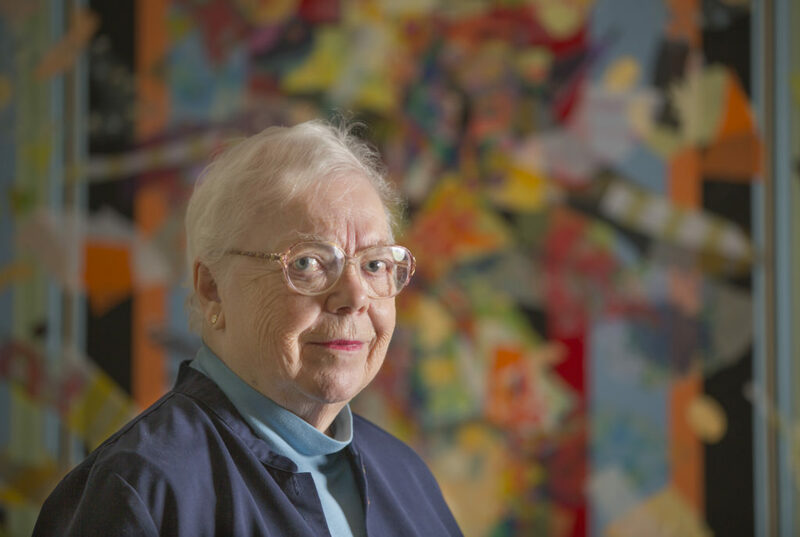 The art world was a very different place when Marilyn Stokstad first joined Kansas University faculty as a professor of art history in 1958. 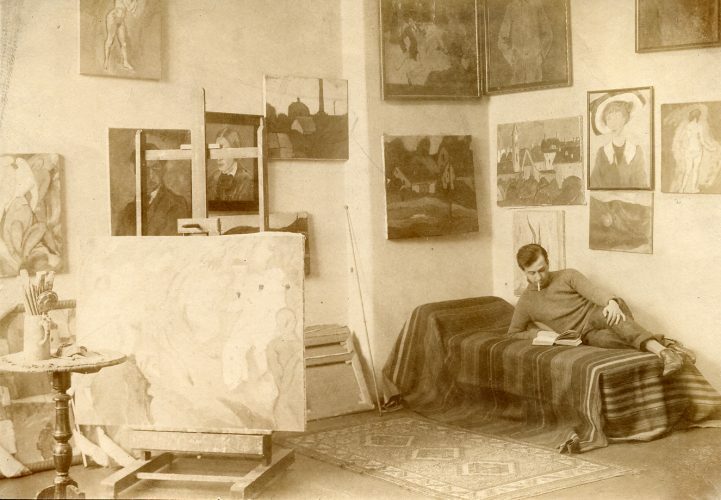 For the most part, Stokstad learned to ignore the frequent, dismissive comments from male colleagues, but when the author of the dominant art-history textbook of the time explained away the lack of women artists in his book by saying, “You show me a woman artist that’s as good as any male artist, and I’ll include her,” Stokstad undertook a project that would become arguably her most lasting accomplishment in art education. The resulting work, “Art History,” (first published in 1995), has since sold thousands of copies, and has become the introductory textbook of choice for art history classes at hundreds of universities worldwide. “From the beginning of her career, Marilyn famously taught her students to question — not to memorize — the lessons presented in their art history textbooks, even when her own pioneering survey text became required reading in the classroom,” Meredith Moore writes in a letter to the Lawrence Cultural Arts Commission. Stokstad, who also served as a department chairwoman and associate dean in Kansas University’s art history program, as well as a curator and director of the Spencer Museum of Art, has authored or contributed to more than 75 publications and curated 38 shows, according to her nomination from Saralyn Reece Hardy. Skokstad officially retired in 2002, but still continues her involvement with the Spencer. Still, when Skokstad received the call a few weeks ago that she had won a Phoenix Award, she wasn’t expecting it. 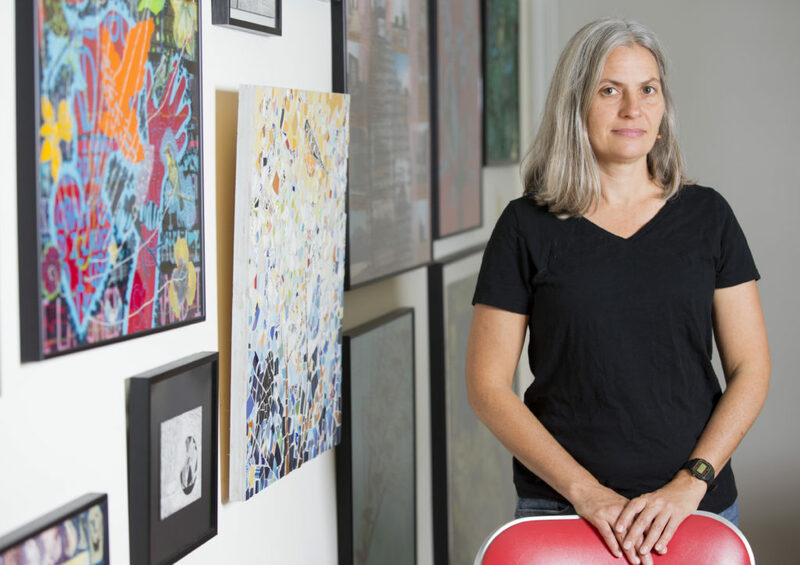 Phoenix Award winner Lora Jost is pictured in her studio on Wednesday, Oct. 8, 2014. 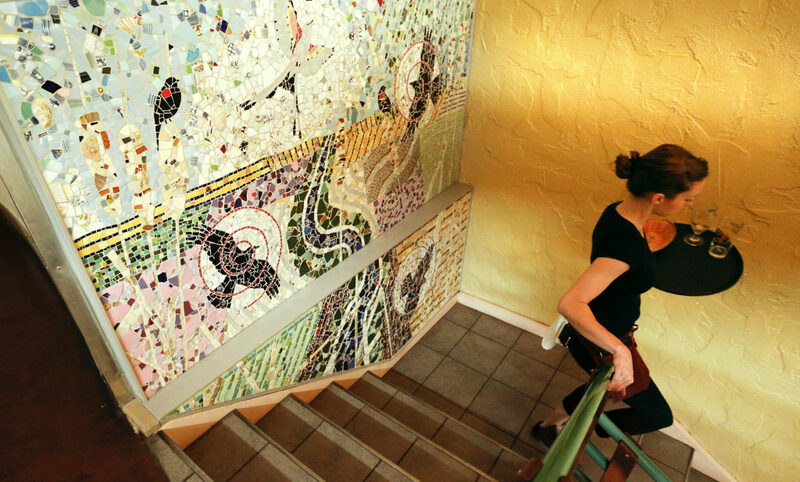 Free State Brewing Co. server Elizabeth Cunningham makes her way down the stairs past a mosaic created by Lawrence artist Lora Jost. Lora Jost’s “Two Yolker,” on the surface, portrays the simple joy and whimsy of cracking open one egg and finding two yolks inside. Take a closer look at the mixed-media piece and you’ll see the two-yolk egg as a “renegade that made it through our culture of uniformity,” Dave Loewenstein states in his nomination of friend and visual artist Lora Jost. “As viewers, we are drawn to the beautiful surfaces but are then quickly challenged to look below the superficial and consider the larger questions being answered,” he writes. For Jost, art, more than anything else, it seems, is happiness. And she wants to spread that happiness around. 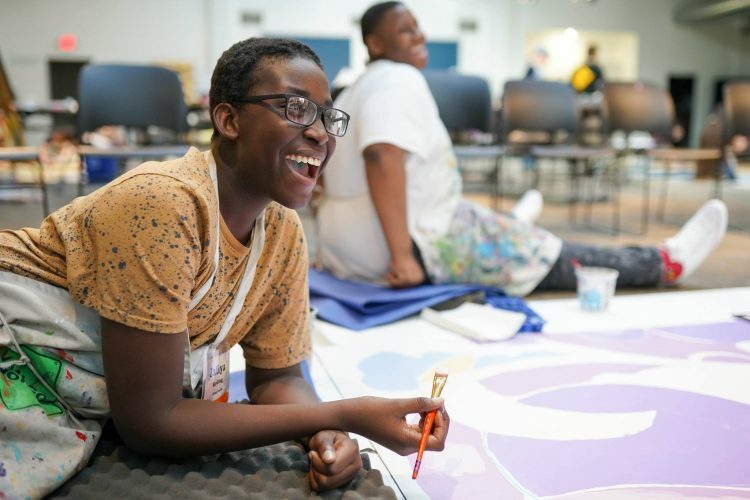 In addition to several public art projects (her most recent being a mural at Free State Brewery), Jost has taught free workshops for GaDuGi SafeCenter and Family Promise. Nick Krug/Journal-World Photo. The Lawrence Civic Choir practices under the direction of Steve Eubanks Friday, Sept. 25, 2009 at First Baptist Church. 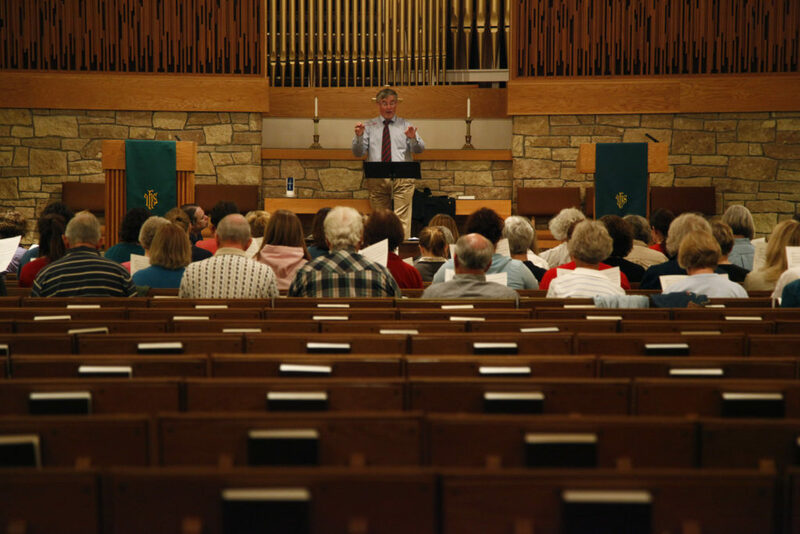 Despite what its name might suggest, the Lawrence Civic Choir, its president David Ice says, has a reach far beyond the rolling hills of northeast Kansas. In the summer of 1980, the group went “behind the Iron Curtain” to Poland, a country that at the time was still under Soviet rule. The group performed a grueling schedule of “seven cities in eight days,” Ice recalls, but it still remains his favorite trip with the Lawrence Civic Choir. The Lawrence Civic Choir, founded in 1975, has shared its music at venues across the country and world. More than 1,300 people have belonged to the choir over the years, and with its 40th birthday approaching, it’s still going strong. Anniversary celebrations will entail a holiday concert in December and another special performance in April 2015. “It’s not easy to maintain a nonprofit organization of over 100 members, but the Lawrence Civic Choir has been able to achieve this through dedication of its singers and the belief that our mission of fostering and promoting the development and appreciation of choral music in our community is important,” Jean Milstead writes in her nomination letter to the Lawrence Cultural Arts Commission.